How do I edit my editable PDF? 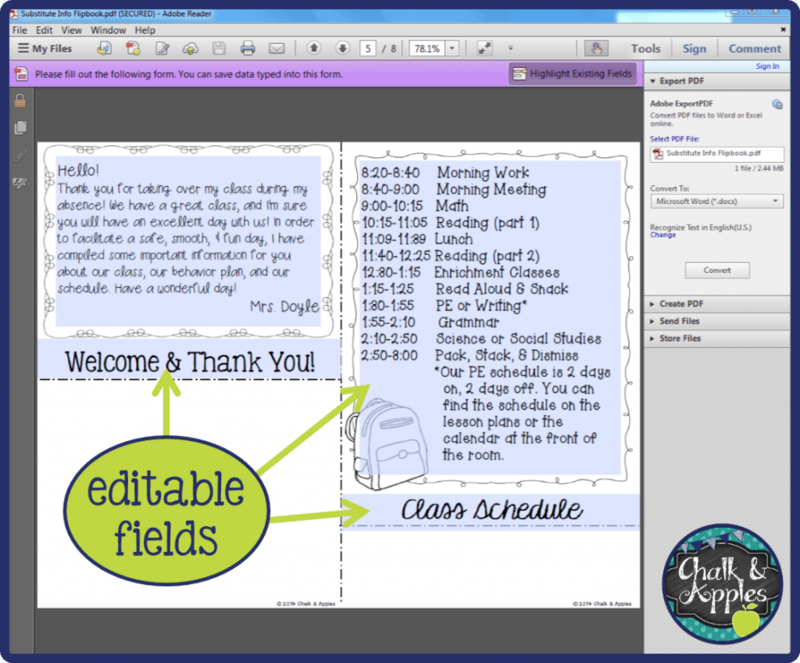 One of the most common questions I get on TPT is regarding the editable PDF files I have in my shop. 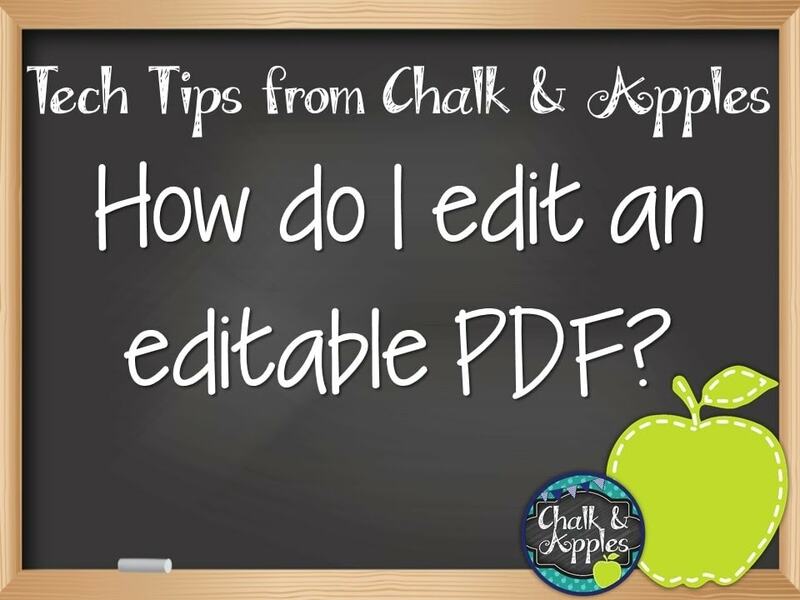 It seems many buyers are not familiar with how to edit an editable PDF file. Well, no worries! 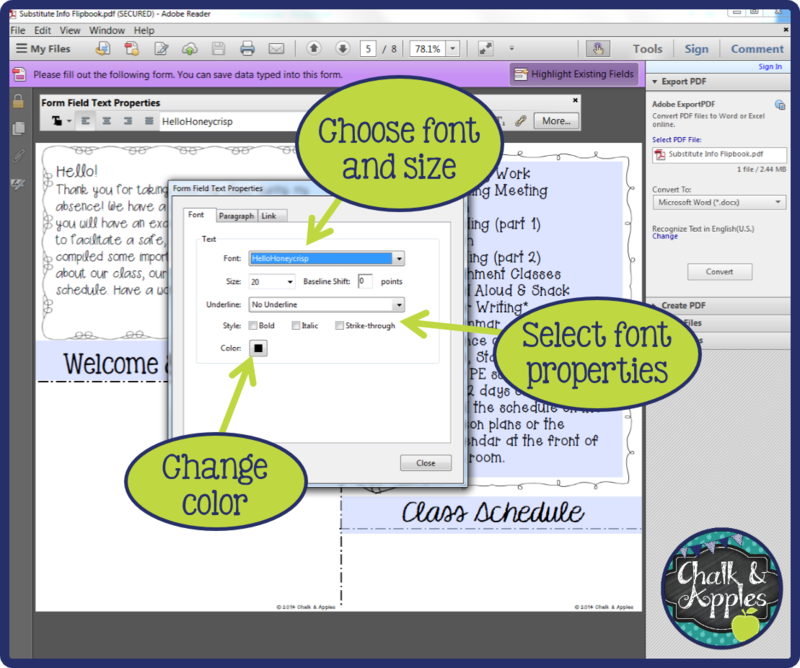 Here’s your easy tutorial on how to edit those editable PDF files! On a Mac, the default program to open PDF files is called Preview. This is NOT Adobe Reader, and it frequently results in frustrated buyers who have files that look all wonky! You will need to right-click and manually select to open the file with Adobe Reader. 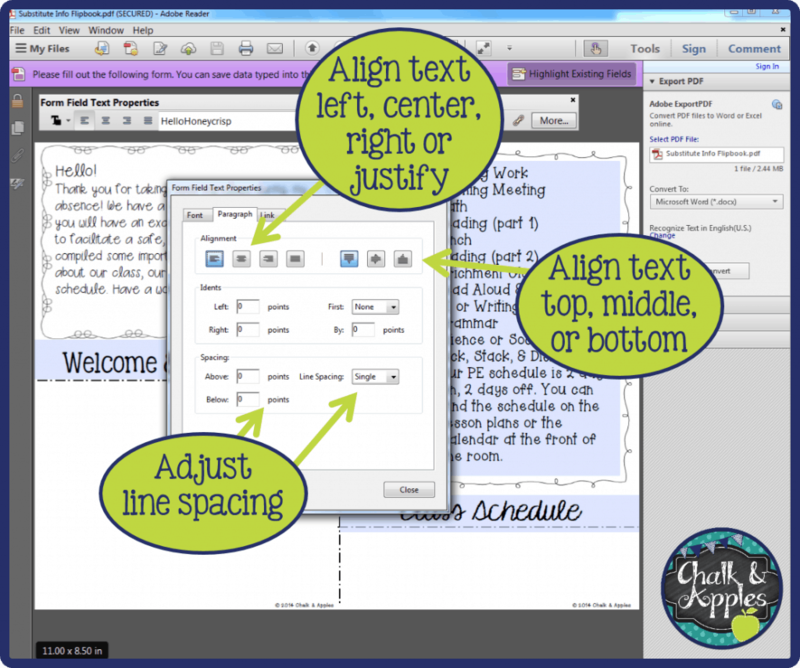 (This is the number one problem my buyers have had with PDF files!) For more information on how to open in Adobe Reader, check out this tutorial. You should see greyish-blue text fields wherever the creator has put editable text. Click in any of those text fields. Then right-click in a blank area of the toolbar at the top of the screen. Select Properties Bar from the drop down menu. Here’s a quick look at all of your options. You can change the text color, orientation (right, left, center), font and size, font properties (bold/italics/underline), and add links. Fonts that were embedded in the file by the creator will still work on your computer, even if you do not have them installed. The More… button at the end of the toolbar will allow you to further edit the file. In the FONT tab, you can choose your font, size, color, and properties. I have found that when font changes don’t “stick” after I change them in the Properties Bar, this usually works better. In the PARAGRAPH tab, you can align the text vertically and horizontally and adjust line spacing. 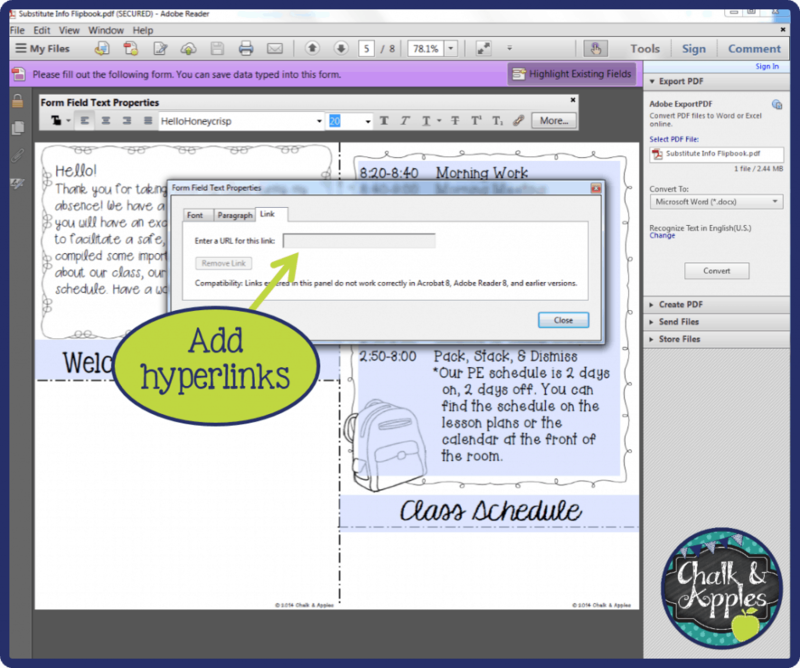 In the LINKS tab, you can add hyperlinks to the selected text. Once you have your formatting just like you want it, you can copy the text and paste it into another text field to keep the same formatting. Then just change the text, and you’re good to go! FYI – This tutorial was created using Adobe Reader XI. The editable product pictured is my Substitute Need-To-Know Flipbook, available in my TPT store. Great post! 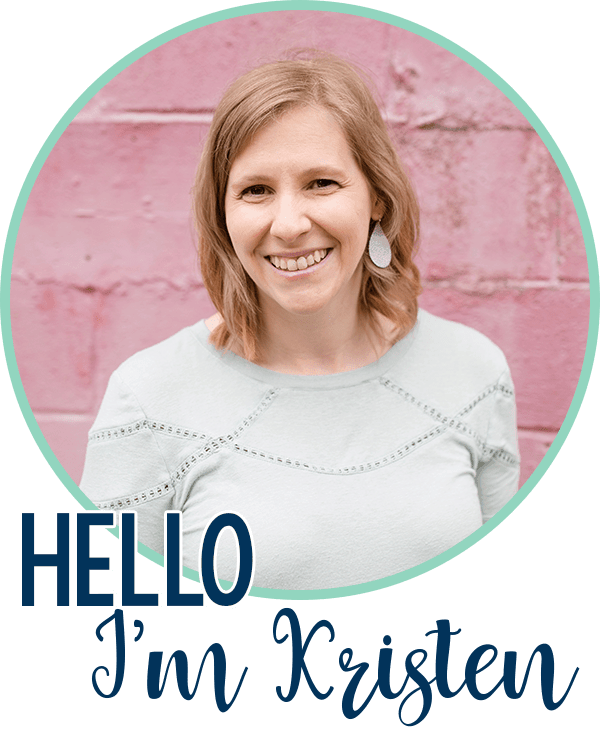 Are you OK with other bloggers sharing this with people who ask about editable products? Of course! As long as you link directly to the post, I'd love for you to share it! I'm glad it was helpful for you! This was a very helpful tutorial, Kristen! Hello- I have edited this flip book in Adobe but when I print it out, it is half a sheet and it has cut off the words that I could see while I was editing it? Thanks for your help. It looks like in your sample that they are a full page each? Maybe not? Thanks…. By the way, you're a no-reply blogger, so I can't email you back! Hi! You do NOT need to purchase anything from Adobe in order to edit my products. You can edit them directly in the FREE Acrobat Reader, which you can download at https://get.adobe.com/reader/. The subscription service with the monthly fee is for creating PDFs, along with a host of other tasks. Hi there! I have followed your link and downloaded the free Acrobat Reader and followed the directions for selecting properties bar. Once doing so it reads "No current selection". I am able to change the text, but cannot change the font style, color or size. What am I doing wrong? Thanks! I'm not sure what file you are trying to edit. It could be that editing fonts is not enabled on the file. You're a no-reply blogger, so I can't email you, but if you email me more information, I'll be glad to try and help! Can you take a look at the Adobe site and see if that's still true? I tried and tried and ended up using Google to find an answer … I think they've decided to make editing a PDF part of their paid subscription, too. I was able to start a 30-day free trial so that I can edit, but otherwise could not edit it. It sounds like you're trying to use the Pro Editing features. You don't need to use those with this file. All you should need to do is click INSIDE one of the text fields, then right click on the toolbar and select "Properties Bar." 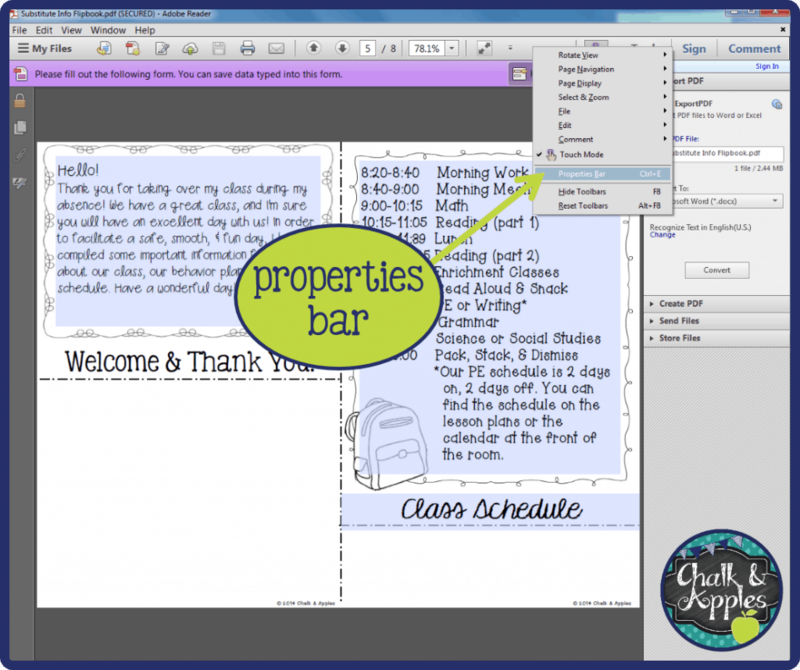 The properties bar will allow you to change fonts and sizes without purchasing Adobe Pro. I am not able to get the properties bar to show at all to change fonts and sizes. I have a MAC. Can you help? If you're on a Mac, the default is to open all pdf files in Preview. Preview does not allow text formatting with the Properties Bar. You'll need to manually open the file in Adobe Acrobat (the free version is all you need). Then you can follow the steps above. Hello, I try to edit but when I try to use the properties bar say there is no selection What should I do? I'm not sure from your comment what file you are trying to edit. 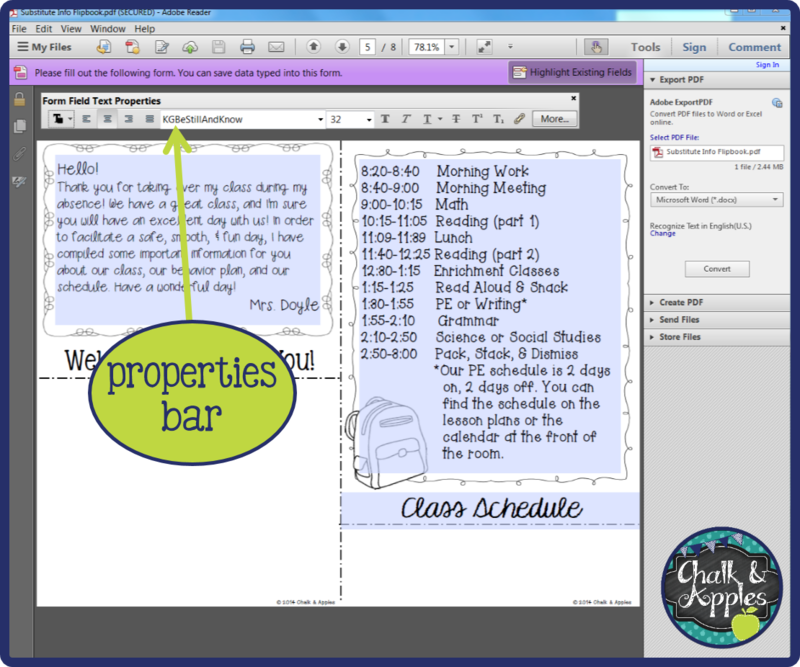 If it's one you are sure should have the properties bar enabled (like my flipbooks), try re-downloading it from TPT. Some files (like my teacher toolboxes) do not have the properties bar enabled. Yes! The class name is editable. Try re-downloading it now. These files have to be updated every time Adobe is, so that may be why yours wasn't working. I've also added a video tutorial just for Mac users at http://bit.ly/maceditablepdf. I am having the same problem as some others. When I click inside the text field and select properties, there is NOT an option to change to font size. I am in the DC edition. I can edit text and underline, bold, italicize etc…the one thing it will not allow me to do is change the size of the font!! Help! Try re-downloading it now. These files have to be updated every time Adobe is, so that may be why yours wasn't working. Thank you for your tutorial. I purchased this product last year and had no issues with editing since the Adobe Acrobat was the version you are talking about. I just updated and the newest version doesn't allow text to change even with the great steps you have mentioned. [Click in a text box, right click for properties….] I am able to edit the text, but I can't change the font or size. Any other suggestions? 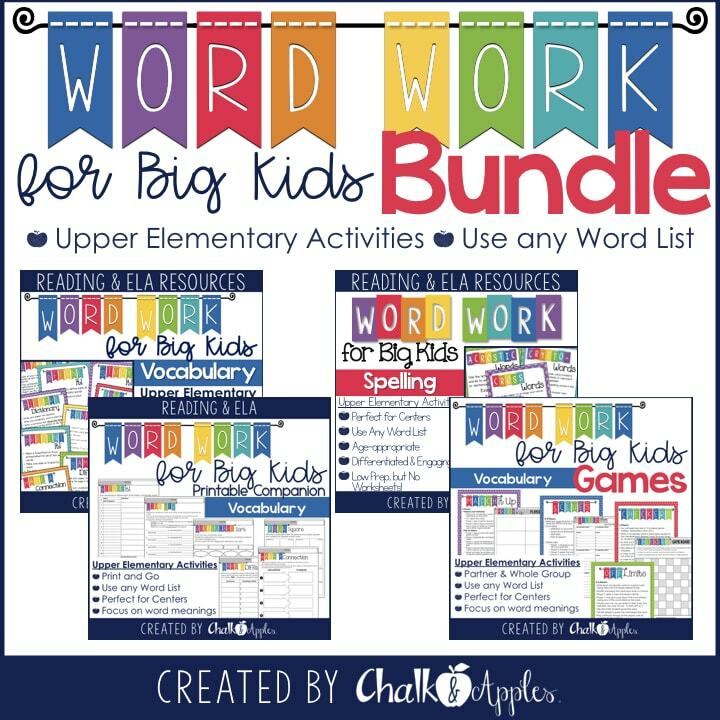 I just updated this file on TPT. Try re-downloading it now, and see if that works! 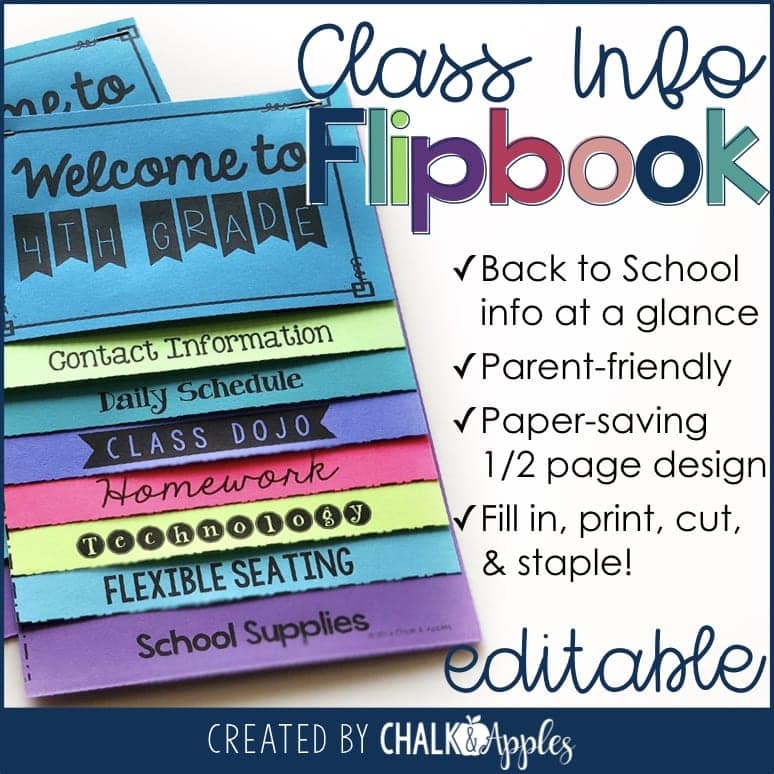 Hi, How do you delete or add or change the clip art in the Welcome Back to School Flipbook for Meet the Teacher Night (Editable Flip Book)? I'd like to delete or move some of the clipart to a different page and I've not been able to figure out how to do it. Thank you. 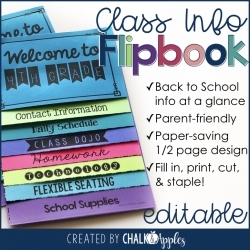 How do I remove or move the images in Welcome Back to School Flipbook for Meet the Teacher Night (Editable Flip Book)? This is amazing! 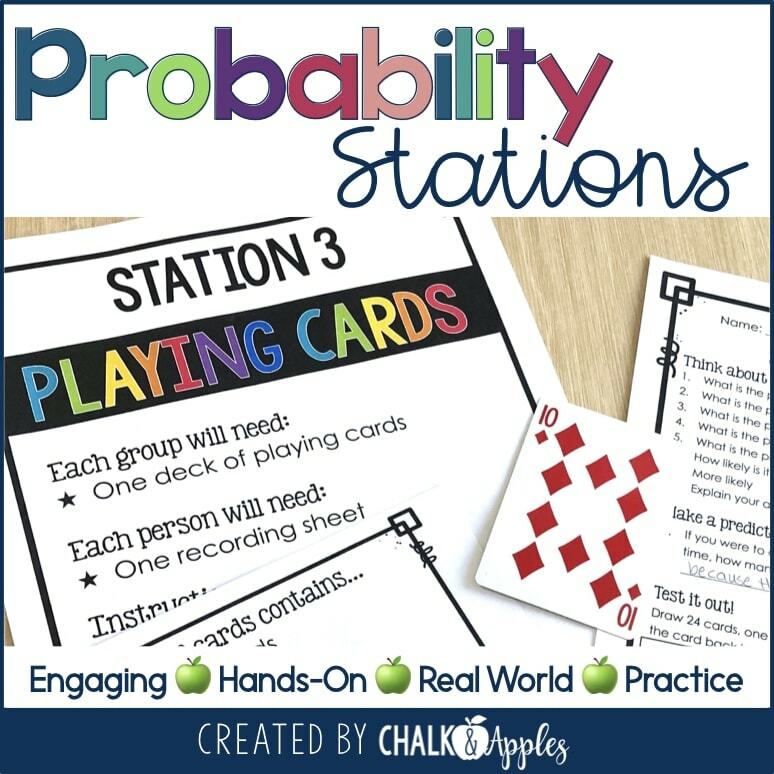 Do you mind if I link back to this post in my teacher notes for an editable TPT product I created? They are so easy to follow, I don't think I could create something that explains it as well.